The HESI Admission Assessment Exam may also be referred to as the HESI A2 or HESI Entrance Exam. The HESI Entrance Exam is used by Schools of Nursing to evaluate and rank applicants for admission. Nursing schools are heavily regulated and have strict accreditation/certification criteria regarding pass rates and retention. These criteria put pressure on the schools to only accept Nursing students who demonstrate a high probability of success in the program. The HESI A2 is a combination of academic and personality/learning style tests that are intended to measure a candidate’s readiness for Nursing schools. The tests are similar in intent to standard college admissions tests such as the ACT or SAT. Each School of Nursing determines which of the HESI subtests are required for their applicants. In addition, each Nursing school has its own criteria for required HESI scores. 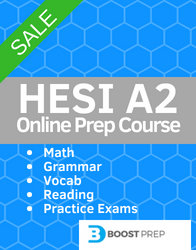 HESI A2 Entrance Exam – HESI Exam Guide’s complete information on the HESI A2 test. Includes information on the test outline, scoring, and study tips. https://www.test-guide.com/HESI/ – Test-Guide.com provides free exam prep material for the HESI entrance exam. The site provides free practice tests, study guides, flash cards and more. HESI Online Study Program – HESI prep course by BoostPrep.com. Include study/review material and 900+ practice questions. allnurses.com/hesi-entrance-exam/ – Allnurses is a forum dedicated to Nurses. The forum includes a lot of practical questions and answers regarding the HESI A2. http://evolve.elsevier.com/studentlife/hesi.html – Elsevier (Evolve) is the creator of the HESI exams. On their site you can find more information on the exam as well as study resources for sale. The HESI Exit Exams are used by Nursing Schools to evaluate a student’s readiness to pass their NCLEX exams. HESI exit exams are used for both the NCLEX-RN and NCLEX-PN exams. Most Nursing Schools require students to take and pass a HESI exam prior to graduation. Each school, however, may require a different passing score ranging from 750 to 900. Most educators view a score of 850 as a benchmark score that will accurately predict success on the NCLEX. Nursing programs usually require a student to take the HESI exit exam during the last semester or quarter of their program. The HESI exams are designed to cover the same areas as the corresponding NCLEX exams and are very thorough. HESI Exit Exam – This is our complete guide to the HESI exit exam, includes details on the test outline, scoring, and how to do well on the exam. www.test-guide.com/hesi-exit-exam.html– Test-Guide.com also covers the HESI exit exam. Their site includes detailed test information and recommended study guides. allnurses.com/hesi-exit-exam/ – The free Allnurses forum includes a lively discussion on the HESI exit exam. The forum is very active and there are daily posts on the HESI. Passing the HESI exams is a rite of passage for Nursing students. Most nurses have to pass a HESI entrance exam to get into Nursing School and pass a HESI exit exam to graduate! Knowing what the HESI is all about is key to doing well on the exams. HESI-exam.com is your trusted resource to help you prepare for and pass your HESI exams. Good Luck!